For this fortnight we have good news for Lennoxtown as a draft place plan consultation reaches us – but do they go far enough for active travel? We also have some of the detail for the development at Clyde Place, Tradeston, now to be known as Buchanan Wharf. In other news we also have some interesting feedback from Glasgow City Council, and Sustrans are undertaking a review on the National Cycle Network. Other than that been it’s very quiet, giving us time to get out and cycle. The proposals for Bunhouse Road and Benalder Street near Kelvinhall were put forward by Yorkhill and Kelvingrove Community Council as part of their vision for a Cycling Village and, as such, deserve our support. Full details were given in Digest 12 and GoBike has submitted this letter of qualified support GoBike Bunhouse Road support 230718 The intention is good but there is a lack of detail on the drawings issued by the City Council and there’s a curious arrangement proposed for the north end of Benalder Street at the junction with Beith Street; the cycle route crosses from the east to west side of the street and no information is given as to what is proposed for Beith Street. That said, the proposals will form a link from Kelvingrove Park to the Clydeside cycleway and should help people living and working in the area to cycle safely. Neil F brought this one to our attention – thanks, Neil. The planning application, ref 18/02021/MSC may be seen at: https://publicaccess.glasgow.gov.uk/online-applications/applicationDetails.do?activeTab=summary&keyVal=PBA6E2EXM1E00 but you might need to put in the application reference, 18/02021/MSC, in your search for it. Lennoxtown is the gateway to the Crow Road for a challenging and popular road climb towards Fintry, and it’s just off the eastern end of the Strathblane Railway Path that runs from Milton of Campsie to Strathblane, so many of us will know the area. The consultation document is quite general but there is a wish expressed to reduce excessive traffic speeds, to stop illegal parking on Main Street and to encourage walking and cycling. If you live in the area or cycle through please do respond to the survey. Sustrans are currently undertaking a national review of the National Cycle Network. We managed to get our response in just before the survey closed, but we apologise that we didn’t get the news out to you in time to also contribute. The review is ongoing though, with a request for participants to their user panel pending. More info on the wider review is here. Nothing that we know of but we expect more coming through after the Fair Fortnight. In Digest 13 we included the reply we had received from Glasgow City Council to our letter supporting the proposed parking controls, GoBike Hyndland Hughenden & Dowanhill West comments 250618 although we also included our views on parking taking precedence over cycling in the area. I am writing to confirm receipt of your correspondence regarding the above named Traffic Calming Scheme and thank you for your comments. Your comments have been noted and will form part of the decision making process. Unfortunately a zebra crossing and a dedicated cycle lane would require a new order, so it’s not possible for this one but if desired could be considered in the future. The build outs are within the existing parking bays, they pose no more of a danger than parked cars and enough space will been made between these and the speed cushions to allow cyclists to safely pass. This will also reduce carriageway width to slow traffic. Enforcement is Police matter not council but speed surveys have shown reduction in average city Centre speeds since implementation. No consultation was carried out before the Traffic Regulation Order was published and obviously no cognisance has been taken of cycling and the need to increase active travel. While the Riverside cycle route through Glasgow Green was closed recently for the Trnsmt Festival people were cycling on the footway along Greendyke Street rather than on the roadway. 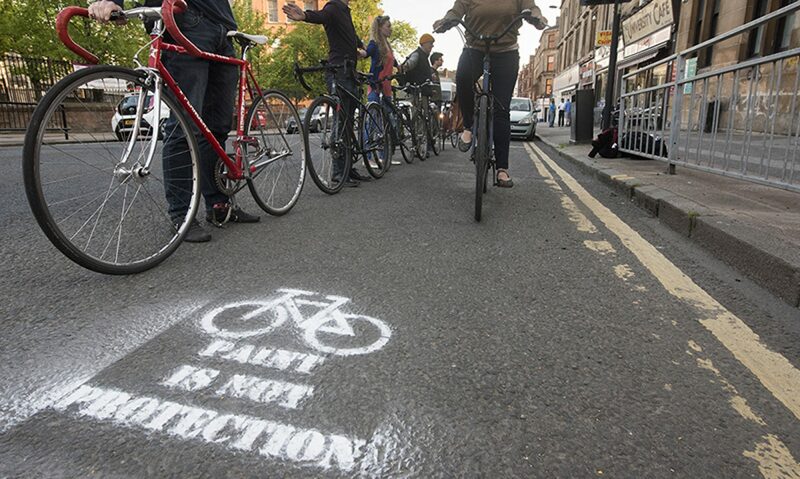 What we would like to know is where is this demand for safe cycling being recognised? That’s all for another fortnight but do please respond to the issues that affect you. The more responses the better. Previous PostPrevious GoBike Call for Action Day – One Week To Go! Next PostNext Call for Action Day – This Saturday! !